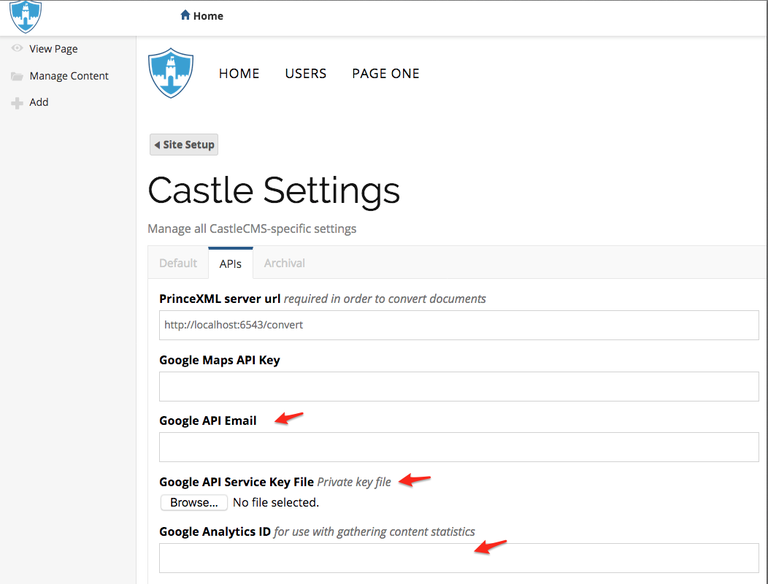 How analytics deploys and integrates into your CastleCMS website. One of the great features of CastleCMS is its integration of Google Analytics. Showing information about your website from within a individual page’s editing interface, site administrators can see current site metrics without needing to leave your website. Site administrators can look at a two-dimensional matrix of different aggregates v. dimensions in real time, or over a date range they choose. This can be for an individual page or the whole site. Dimensions are attributes of your data. The dimension "City" indicates the city, for example, "San Francisco" or "New York", from which a session originates. The dimension "Page" indicates the URL of a page that is viewed. Aggregates, or Metrics, are quantitative measurements. The aggregate "Sessions" is the total number of sessions. The aggregate "Pages/Session" is the average number of pages viewed per session. 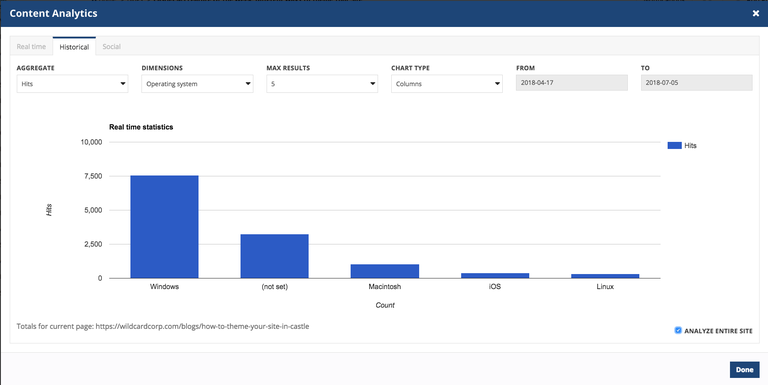 Get results for the top 5, 10, or 15 items visually displayed as a pie chart or bar graph. 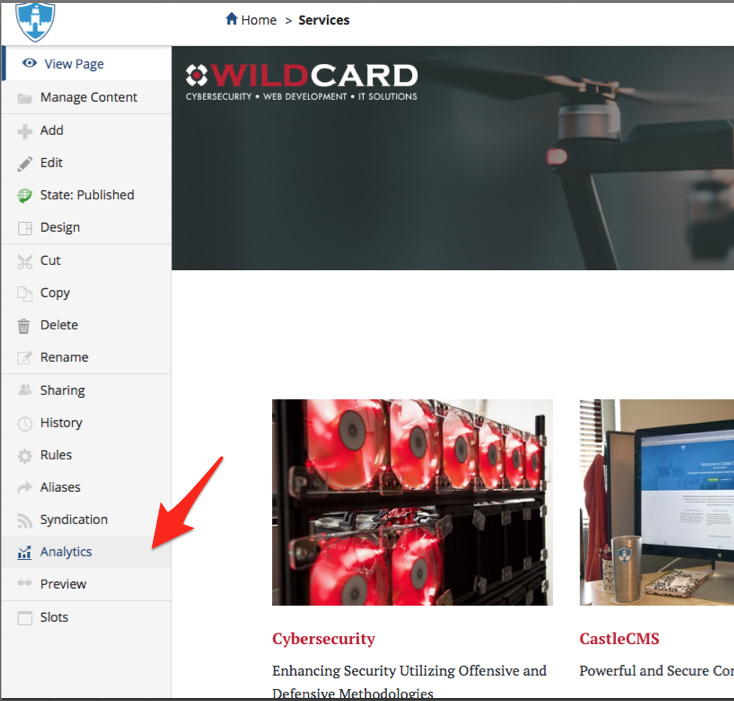 Wildcard, when setting up your website, will enable Google Analytics to have access to your site to begin tracking. By adding a few lines of code, analytics will begin to display on your Google Analytics account page. Setting up analytics on your site can be done in two steps. Ensure your website is set up to let Google track and analyze it. Authorize your CastleCMS site to show the Google graphs locally. You will need to copy the tracking code that Google gives you and paste it into your site. This code looks similar to the following with "GA_TRACKING_ID" changed to your ID. To do this, log into your website as a site administrator and click on the "Cog" in the top right of the screen and click "Site Setup." Once there, click on the “Site” link found in the “General Area." 2.) 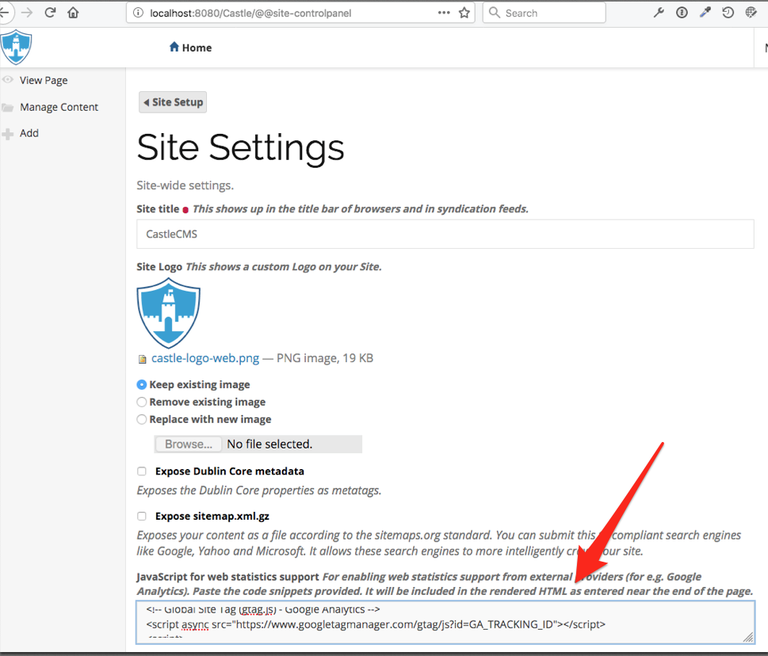 Authorize Your CastleCMS Site to Show the Google Graphs Locally. Google requires you as a website administrator to have a special Google API email account and to have a .p12 certificate bundle file before analytics will fully function on your site. Google has a good web page explaining how to do both of these things. You only need to follow "Step 1: Enable the Analytics API" on this list. Make sure to note what your email API is, and to save the .p12 file somewhere you will remember for a future step. Once these two tasks are complete, go back to your website and click on the "Cog" icon at the top right of the screen and click "Site Setup" > "Castle". Next, click on the "APIs" tab. Second is the "Google API Service Key File" or .p12 that was created. Upload that here. The third field is the "Google Analytics ID". This is your analytics tracking ID. Usually it starts with "UA-". To find this, follow the steps below. Under PROPERTY, click "Tracking Info" > "Tracking Code." Your tracking ID is displayed at the top of the page. Copy and paste this ID into the "Google Analytics ID" field on your CastleCMS website. Your CastleCMS website is fully set up to work with Google Analytics and give you some great insight on how your site is being used.